Carlos said he expected to see fear in Norman’s eyes. He didn’t. “I saw love. On the way out to the medal ceremony, Norman saw the badge being worn by Paul Hoffman, a white member of the US Rowing Team, and asked him if he could wear it. It was also Norman who suggested that Smith and Carlos share the black gloves used in their salute, after Carlos left his gloves in the Olympic Village. This is the reason for Tommie Smith raising his right fist, while John Carlos raised his left. Australia’s Olympic authorities reprimanded him and the Australian media ostracised him; Norman was also banned for two years on his return. Despite Norman running qualifying times for the 100m five times and 200m 13 times during 1971/72, the Australian Olympic track team did not send him, or any other male sprinters, to the 1972 Summer Olympics in Munich, the first modern Olympics since 1896 where no Australian sprinters participated. Norman died of a heart attack on 3 October 2006 in Melbourne at the age of 64. 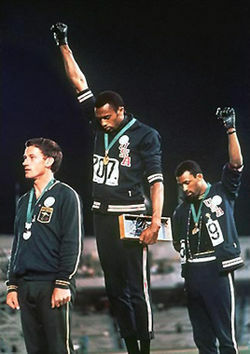 US Track and Field Federation proclaimed 9 October 2006, the date of his funeral, as Peter Norman Day. Thirty-eight years after the three made history, both Smith and Carlos gave eulogies and were pallbearers at Norman’s funeral. and they stood by him…. John Wesley Carlos (born June 5, 1945 in Harlem, New York) is a former track and field athlete and professional football player. He was the bronze-medal winner in the 200 meters at the 1968 Summer Olympics and his Black Power salute on the podium with Tommie Smith caused much political controversy.